Currently on DVD and available on all leading digital platforms on November 17th from director Miguel Llanso and IndiePix Films is a look at life after a post-apocalyptic event and those left with CRUMBS. 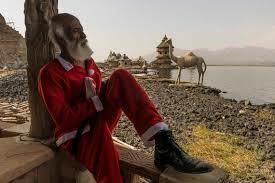 Candy (Daniel Tadesse) goes out into the world daily looking for the strange and unusual. Living with Birdy (Selam Tesfaye), the woman he adores, it is his hope to make her as happy as possible. Above the bowling alley in which they live is a space ship that seems to have no purpose other than keeping Gagano and Birdy nervous. Then the space ship begins to come alive and Candy wants answers but, more so, wants to join the ship believing that because he is different on the outside, he must be one of them! 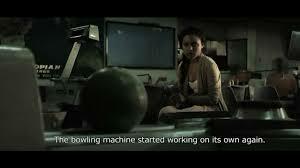 In the bowling alley they both hear someone speaking to them through the ball return. Determined to find answers, Candy seeks the witch and with a payment of a Michael Jackson album is told to seek out Santa Claus. While on his journey to the old city to find the jolly St. Nick and solve the worry of the spaceship, Candy comes to terms with a life he tried to terms with a life he had been trying to forget. Tadesse as Candy is a true treasure! It takes only moments to realize his physical appearance is a minute part of this characters persona. Instead I was completely drawn to his beautiful eyes filled with longing, his reactions filled with a story yet to be told and a love that no one could possible take away from him. 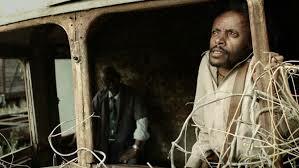 I have nothing but a standing ovation for Tadesse’s performance. Tesfaye as Birdy is a talented young woman who takes junk and brings beauty to the home she had made for herself and Candy. When he leaves to discover the meaning behind her dreams from the witch, she comes to realize how important he is to her life. Tesfaye brings beauty in the midst of chaos and confusion. TUBS OF POPCORN: I give CRUMBS four tubs of popcorn out of five. I will be totally honest that at first, I didn’t think I could get any further than 10 minutes into the film. Instead, I was riveted to the entire film from start to finish. Seeing civilization in this Ethiopian landscape after an apocalypse, the viewer will recognize so much of what might be found in the future world. From Michael Jordan as a god to the importance of the stories behind Mattel toys, a Ninja Turtle to a ceramic baby Jesus in a manger. It is the costume that Candy brings out later in the film (I am not going to spoil it) that moves me so much. 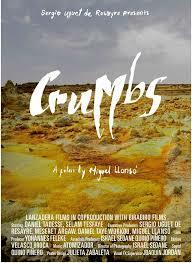 CRUMBS has been shown at the Rotterdam International Film Festival and EFM in Berlin. 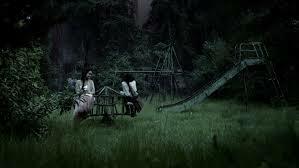 At the Los Angeles Film Festival it won the special Nightfall Jury Mention and Best First Feature Film at Montreal’s 19th Annual Fantasia International Film Festival. Also, CRUMBS has received the Imaging the Future Award from the Switzerland Neuchatel Fantastic Film Festival and the Underground Spirit Award at the Serbia Palic Film Festival. This film will bring out emotions you wouldn’t expect with visuals that are jarring and stunning with a soundtrack that brings the entire film together. After the initial look on my face of ‘what the hell?’, it quickly turned around to wanting to know and understand these two characters and the story they were telling without a lot of words to complicate it. Just marvelous! In the end – it is a surreal journey into reality!